One of the puppies�is graduating from college in two weeks, and will be moving to New York.�She is a�Math major with a Fine Arts minor, with plenty of street smarts - plus a Division 1 Varsity sport. She sealed�a�deal with the job she wanted�in back in November. Nice little "signing bonus," too. Yesterday�she emailed me the website for the�building in NYC into which she will be moving. 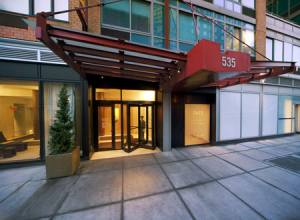 Dang nice.�This building has a doorman, a gym, and rooftop gardens. Plus she will have 6�pals from college and high school in the same building. Look out, New York, for the approaching tornado. When I lived in NYC, I lived in hovels and basement apartments with slovenly roomates and cockroaches, had few friends - and no money to paint the town even if I had wanted to. In those days, there were no buildings with gyms, indoor pools, and rooftop gardens anyway. Check out�the details of�the apartment�building.�I am jealous, but a professional curmudgeon like me should say "The kids today are so spoiled. They should be suffering and struggling, or�in the Army, instead of romping around." She says she expects to work from 6:30 AM to 11 pm, so I guess it won't be all fun and games, and the pressure to be outstanding will be enormous...but that's Life in the Big City. Our oldest lives on the other side off of Houston (say "House ton" if you don't want to be laughed at). Really glad she can afford it. Really really glad she likes it. Some really good restaurants in the area tho'. They have a sort of dill pickle there that I really really like. WHICH "other side of Houston"? SoHo or NoHo? And don't tell me you like those NYC half-pickled pickles! Sheesh. I'd rather have a raw cucumber. Yeah, those pickles! I like cucumbers too, but I can eat those "fresh" pickles until I'm stuffed. I don't know the "SoHo NoHo" terminology (and after Imus might be afraid to use it!) -- she lives between Houston and Delancey on the East side. Oh! and my lord. How rude. My son is graduating w/ a math major also, and also got an excellent job offer. That's the ticket, the major. If she were an art major, she wouldn't have these opportunities. Even better for a gal, but, in general, they want hard evidence that you have had rigor in your education. I'll have to ask--I don't think my daughter got any of that, but I do strongly believe that she was "observed" long and hard as a student and as an intern. She had a job (several I think) waiting for her since the second year of law school I thik. Being 1st or 2nd in her class helped I suppose. Looks like cabs were not a problem when the picture was taken. As usual, the arrow is obviously off a bit, and it looks to me like maybe the building had not been built yet. (My daughter's building appears to be "under construction" and about the foundation, the las time I looked. Delancey street. A grand old New York name, after the DeLancey family which arrived in NYC in 1686. 1686 --one of the few years that predate my nativity. I can't say I've really lived in NYC, but if one is allowed to tally accumulated time then I'd get close to a year, with the longest time being two months. Admittedly that's pretty feeble but as in bridge I'll open with a club. My experience with NYC first began as a young CIA officer, learning tradecraft. We'd fly to NYC, have a time to redezvous with our target who wouldn't know us but would be appropriately stationed at a certain location. Within a fiftenn minutes window the tracking would begin. It was great fun and we always got busted by the "old hand" who knew how to detect a tail. After that there were many trips to NYC for various reasons. Life after the NYC CIA experiences of the 1970's turned to Wall Street firms during the 1990's. At that time I had an apartment immediately next door to the World Financial Center with a picture window view of the Hudson River and the harbor behind WinterGarden. Mornings would find me with a bagel and coffee at the window, using the sill as a heel hold for my morning stretching. The some Tai Chi. That lasted two months. Itook full advantage of that Fall season, a most wonderful time in NYC to cover as much of the sights I could fit into a weekend. Being avocationally an historian I relished in walking in the places where Washington and the rest had tried to defend Manhattan. To me NYC is a memory of smiles in my life with one tragic exception. While hiking in Yellowstone on 9-11-02 I learned that the WTC buildings were no more. It was a horror I still cannot comprehend and it fills me the rage I felt as a young US Marine and CIA officer in Vietnam. It was ten hours after I heard about the attack before I saw the tape. I wanted to be 20 again. Not for the girls or simply the youth. I wanted that age back to seek out and kill those who had done that dastardly work. I would kill them today if age were not a barrier to service. But NYC was for me, in my life a wonderful place. I have always felt that some portion of ones life should be spent on those lovely Autumn days in NYC. Very engaging post, habu. It is for a fact still a gut-punch to think of that event 9-11-01 event. Still unbelievable, otherworldly, and a casus belli now and forever if that's what it takes. I heart NYC, too, even if it did put Hillary in the senate. Congrats to BD and LS for getting the offspring in shape to take flight so strongly. Three cheers--it is a lifelong task, a serious matter. Thanks. But what we mostly did was stay the h*ll out of her way. I never had to or did, for that matter, but they also teach it in law school sometimes. Some of the manners are quite basic, and while it is sad that you have to teach them, you can't blame the kids. Some of the manners are quite complicated, actually (like how to properly eat soup), and I do not recall learning that growing up, as well mannered as we were. "White shoe" and "silk stocking"? What is means is this: If you have to ask, you aren't in the club! Basically, it means Social Register. Ohhhh math--ahh the beauty of it! Not just the doing of numbers--but the payback. Math describes everything, including art. If you can't explain it using math (what every "it" turns out to be), you don't understand it. I've read all those and more somewhere. I have no idea what they mean. What they mean is, some people are smarter than you and me. OK Dad: you are too smart to let her commit to a rental payment of $3800 +/- a month. Get in there and help her get started on owning her own--shhez! Good Lord --you can buy whole counties in West Texas for $3800. ...and get back a little beer & taco change! BD: yes, I know about room mates. How about this--you and daughter buy a condo--she rents a room to a room mate and takes in some cash to supplement the payment? I know, I know it is too soon. You are wise to hesitate. It's just that dang price tag is outrageous compared to rentals in the rest of the country--I think? Buddy: In 1982 there was a fajita place in Lubbock. It was in an old gas station--really old. Nothing boutiqueey about this. Yesterday it was a gas station --today it sells tacos. Surrounded by hot black top, they had put up a few tables with umbrellas! Two coronas and an order of Fajitas did me in for the rest of Saturday afternoon! Pish tosh on the Social Register. To be registered like a cow or other farm animal is not exclusivity.